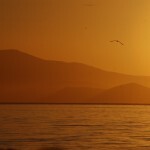 I arrived at 7 p.m. from Samos in the Lakki Marina a large relatively new marina with a couple enormous travel lifts for maxi catamaran haul outs and storage. I got my shower and filled the water tank. Then I decided to moor med style on the town’s waterfront only to find out that I ended up in another marina, the Leros Marina. Slightly cheaper (about $22.00) than the previous night but right in town. 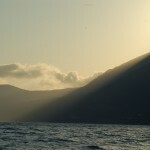 It was a very fast sail from Samos. A broad reach with winds from 10 to 25 knots. I sailed right by Pathmos. In the one day I met about 10 different nationalities in the boating community here. Philippe a Belgian and his Portuguese partner had me over, on “Jade”, for drinks and dinner on their boat together with Gerard a Breton. I plan sail to Astipalaia today and then on to Santorini. I may not have internet access for the next couple of days. A southerly is supposed to come in on Friday and that is the wrong direction to sail to Crete so, I may have to sit it out on Santorini for a couple of days if I cannot make it to Northern Crete by Friday. Sailing into Kusadasi Turkey is not going to work. Too much hassle with cruising petmits, etc. just to go to Ephesus. I left this morning from Chios but not early enough to make it to Pythagoras so I put into Mathakambos on Southern Samos. I put a third coat of Cetol on the trim this morning and that slowed my departure down. It was a beautiful day with a mild Northerly. But it petered out and I set up my 3/4 ounce spinnaker but when I was ready to hoist the wind all but disappeared. Cranked on the engine but after a half hour motoring the wind came up from the SW and slowly hardened to the West and then NW. I started with full main and my 120 percent jib. The wind kept strengthening and I was averaging 6 knots. A great sail. But then I went to one reef, next a second reef and when I got to the channel between Samos and the island to the west of it it got really rough and the main went down. Still doing 6 knots on the 120 percent jib. I have not used my 120% jib much in the circumnavigation. Mostly I go from my 145% to the 90%. This 120 was also made by Garry Triplett in Bellingham. His sails have lasted me longer than any other sails. Great workmanship. These sails are 32 years old… I wonder what ever became of Triplett and Loren McGruer of Thunderbird sails in vancouver B.C. whose sails are also from 1980 and still being used. It is now Sunday morning and after checking the distance to go to Crete and the places I’d like to stop on the way I decided to head south from here to Leros. 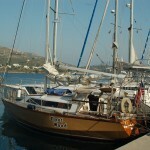 I need a shower and fill my water tank and there is a marina on Leros. Next stop will most likely be Santorini. Pathmos is also on the way, where supposedly Saint John wrote Revelations but the anchorage does not look that appealing to me. 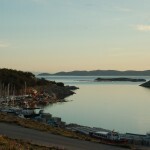 I shall have some one push me in my wheelchair through Ephesus adn Pathmos when I am done sailing. 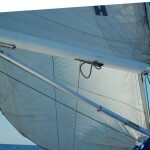 The above picture also shows the trademark of Hyde Sails in my main sail. This is the sail that was donated to me, when I was in Cebu, by Guus Bierman long time friend and owner of Contender Sail Cloth. Another, much braver circumnavigator, who just completed the incredible circumnavigation of the Americas (www.soloaroundtheamericas.org) by way of the N.W. Passage and Cape Horn in a 27 foot plastic boat, Matt Rutherford also used donated Hyde Sails. He also used the same wind vane as I have, the Monitor. The weather has turned to perfect sailing conditions. The Northerly Meltempi has brought nice 10/15 knots of wind, dry air, deep steel blue skies and unobstructed visibility. My laundry is being done and after doing some provisioning and reorganizing the boat I shall be on my way early in the morning. 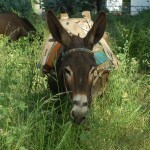 I am going to try and make it to Kusadasi. Then I will take a day tour to Ephesus. 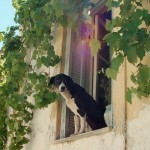 Next I will head for Southern Crete, via Mikonos and Santorini. 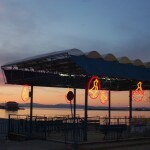 The two day tours to Ephesus from Chios have not started yet, too early in the tourist season. 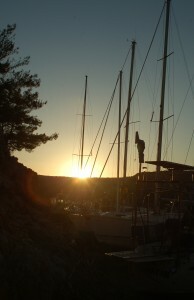 From Crete I plan to sail West and into the Adriatic and arrive in the North Adriatic by the middle of June. 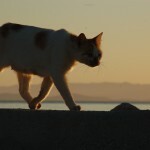 For those reading the blog and planning to spend time in the Chios Marina: There are no longer any wireless connections to be picked up, like last fall. Even with the best antenna. “Fleetwood” is back in her element. She was dunked at noon. In all the haul outs I have done, this one in Chios was one of the best. Very professional and inexpensive. The couple that own the yard Adonis and Katina Chiotis are a delightful team. Fortunately I had little maintenance to do because the location is somewhat far from civilization. Green Cove Springs on the St.Johns River in Florida remains my favorite for Stateside haul outs. 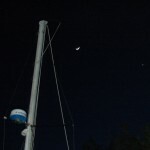 I stil have to do some straightening out to do and to hank the mainsail back on. My folding bike needs maintenance. The salt spray, last fall ruined the chain. I am going to check on taking a ferry to the Turkish mainland and spend a day seeing the biblical significant city of Ephesus. Or I might sail to Kusadasi. My oldest granddaughter, Corrine, will arrive in Amsterdam May 29 to finish her college degree from her Pacific Lutheran University at the University of Amsterdam. She might stay as long as the end of January. So this will be a great opportunity for me to show her around her grandfather’s roots. I might sail the boat back to Amsterdam before the beginning of the fall storms on the Atlantic or winter the boat in southern Portugal and land travel to Holland. “Knippen en Scheren” (A hair cut and Shave) is what the Dutch call a spring cleaning haul out. One of the oldest cartoons I can remember is a waiter walking up to a client in a fancy Paris restaurant. The waiter is bothered by the man’s manners who has strapped his napkin around his neck. The waiter asks him: “Est pour la barbe ou pour les cheveux?” (Knippen of scheren?). I am done with most of the work and will apply the first coat of bottom paint tomorrow. While waiting between the coats of touch up paint on the hull and the varnish of the trim and transom I have been doing a fair bit of socializing with fellow boaters, Gerard the Frenchman, Peppe from Turin, Jos and Els from Almere on “Iris” and Lennart from Gothenburg who I had met last year on Mytelene. Friday I finished sanding the boat bottom. It took most of two days. Last year, in Zimnicea, it took me about two weeks. This time, for the first haul out that I can remember, I did not have to expoxy resculpture the usual damage to the keel. Just a light sanding. I start bottom painting tomorrow and should be back in the water by the end of the week. A lady friend from New York, who I met through the connection with the “Groote Beer”, and her brother Arnold are visiting Athens for a few days. They both knew the very first American owner of the “G.B.”. Their mother lived in Athens for 40 years and they both know the country well. They showed me some of the sites on a perfect spring day. I take the night ferry back to Chios tonight. I have a berth in a 4 person cabin. No more agony among the chain smokers on the deck. There are no church pictures. I tried hard enough to get to a mass service but without a sextant or GPS I am a total failure. I walked in circles for miles. St. Dynosious church and Google maps have a difference of opinion on its location or it must have ascended into heaven and a grafitti plastered building descended in its place. I’ll make it up, I promise. 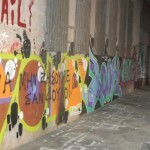 Athens Graffiti capital of the world, worse than Amsterdam……. 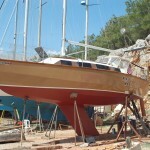 Tired but satisfied after a hard day of sanding the boat bottom.. The buses did not run on Easter Monday and I had to spend 15 Euroes to take a taxi from Chios town to the yard. It was raining off and on and I spent most of the day getting things organized again. The boat wintered well. I bought a Bosch 6″ (150 mm) disk sander in Athens. Just two hours short of finishing the bottom sanding today I ran out of options. The Bosch sander came with a Velcro pad and three sample disks. I have a 10 year supply of stick on disks. So, I used the three Velcro disks till they were worn and spray glued the stick on disks to them. A good idea but after an hour or so the velcro lost its grip. Gerard, Un Français très sympa, has a car here and he is going to take me into town tomorrow morning and I hope I can find a supply of these 6″ velcro disks. I had hoped to be ready for being put back in the water on Saturday but it looks like it will be Monday. Yesterday it rained most of the day and Jos from Almere took me into town in his rented car to grocery shop and to internet. But then I found out through Gerard that they do have WiFi here after all. So, I don’t have to go to town for my e-mails/web posting. A new plan is forming in my vagabond brains. Instead of heading south and east along the Turkish Anatolian coast I may try and be back in Amsterdam by the end of the summer. Corrine , my oldest granddaughter, will be taking a semester this summer at the Amsterdam University. And this might be a unique opportunity to show her our roots. I’m charting the voyage through Gibraltar and North. Stay tuned for the next “Where is Jack” mail. 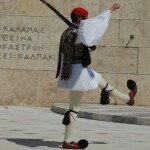 After all the rain and thunder storms this morning started out clear, bright blue sky, Greek picture perfect. Special post. History is being made in solo circumnavigating. Matt Rutherford is about to acomplish something that will, in my humble opinion, be nearly impossible to ever be accomplished again. The circumnavigation of the Americas, non stop solo through the N.W. passage and around the Horn in an ancient 27 foot plastic sailboat on a beggar’s budget. 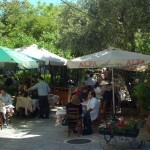 April 15 Easter Sunday in Chios. “Χριστός ἀνέστη!” Cristo Anesti! Christ is Risen. That was the greeting at St.Nicholas Roman Catholic Church’s Easter mass. Since a number of years the Western Rites in the predominantly Orthodox countries celebrate Easter on the same calendar as their countrymen. 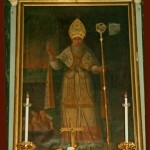 It is a coincidence that my home parish in Gig Harbor is also St. Nicholas. 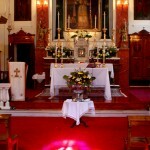 It is a small church and the members are predominantly from countries other than Greece. I met a Portuguese, Irish, several Polish members and a couple Filipino families. 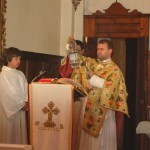 The parish priest is Greek, assisted by Walter a Brazilian priest from German parents and a Greek seminarian. The church was built in the 14th century, destroyed by the Turks, burnt down and rebuilt in the 17th century. I did not get much sleep because the Greeks celebrate Easter vigil like other of us savages celebrate New Years eve with fire crackers and a heavy duty ear drum buster. They prefer to explode them in the narrow alleys of the old town where I happened to try and get some sleep. When I arrived on the East Coast in 2007 I could count up something like 58 different churches I had attended in the 2 1/2 years voyage. I have long since lost count but I’ll be sure to check my record when and if I make it through the Heavenly Gates. But I did just put away my old passport. I was issued a new one in Amsterdam, last week. It had two refills for the 10 year validity, 16 Visas and 127 border crossing stamps. The rain is coming down in buckets while having lunch in my favorite hang out facing the Chios harbor. 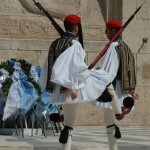 It is the Greek Orthodox Easter weekend. Practically all the tourists are Greek, visiting their ancestral home for the Easter celebrations. The ferry from Athens arrived at midnight and I found a 25 Euro decent hotel. Because there is little I can do in the rain on the boat and I might as well take part in another Easter experience I have decided to spend Saturday and Sunday night as well at the hotel. I made my grocery purchases this morning and visited the paint/hardware store, because it is a long way from the yard to town. The ferry ride was something I hope I’ll never have to repeat. 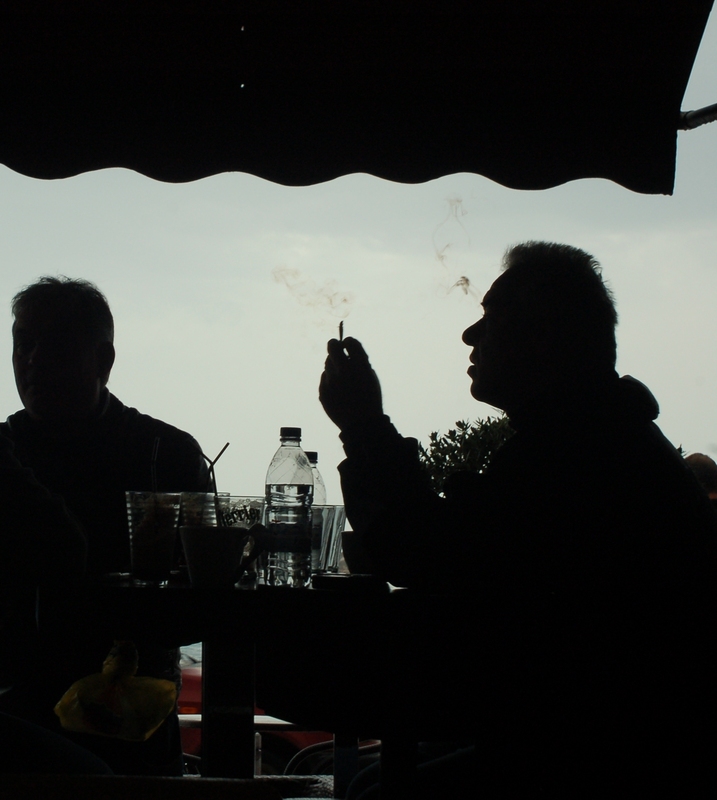 On the way to Athens, last November, on the same ferry, I had a reserved lounge chair. This time I was a deck passenger. And this is how the chain smokers travel. I sat wedged on a life vest trunk between three chain smokers, for 6 hours…. 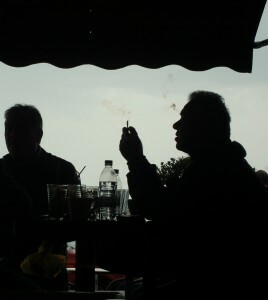 Smoking in Greece is almost as bad as Romania and Bulgaria. Depressing. Their butts clogged up the floor drains and the rain water was sloshing around the (covered) deck. Thank God for I-phones this cuts at least into the boredom of the unemployed. I have a suggestion for the Greeks: offer the bored children an I-phone in exchange for amnesty and their spray paint cans. 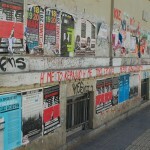 Along the entire 10 odd kms from Athens to Piraeus every accessible square foot of vertical surface is covered with graffiti. The forcast is for occasional showers most of the coming week. Fortunately most of my maintenance will be below the water line. This morning I received an offer from Holland to publish “De Mastmakersdochters”, without expense to me. I hope to have more details and cost for the potential purchase cost of the book. I still expect to also publish electronically. But, at least, this is an important development and would give those “traditional” readers access as well and this confirms that the effort is publishable. You may have heard about today’s news of a German vessel that was intercepted on it’s way from Djibouti to Tartous, Syria with a cargo of embargoed weapons. This re-opens a wound of my past life as a timber trader. In 1976 I chartered a Danish vessel the “Pep Orient” with a load of sawn timber from Oregon to Tartous. The shipping company in Montreal fictisously declared “lay days” about 4 days before arrival at destination costing me a lot of money. How did the French, who govern Djibouti, let this happen on their watch??? Be sure to try and read a copy of the upcoming July/August “Wooden Boat Magazine”. They are publishing an article I wrote, and much improved with their editing and artwork, about Botters and the Nieuwboer yard in Spakenburg. It also has a section about the maritime museums and traditional sailing events that you must read. A way to find out how to spend a week for young an old around the former Zuiderzee and fishing and maritime lore. Last week I found a comment on my blog from a young lady who, in all likelyhood, has found a way to reunite with her father she has been searching for for the last 41 years. I am excited to be her link and I am hoping and praying that it all will work out for her and these events make it all worth the effort of making friends and writing the blog. I’ll let you know.